I heard a knock on the window about this time last year and there were my two boys, standing in the grass looking sweet and innocent, both grinning from ear to ear. There hands held the green stalks of almost ready to bloom pink camellias. "Look Mama, we pulled some weeds for you!" 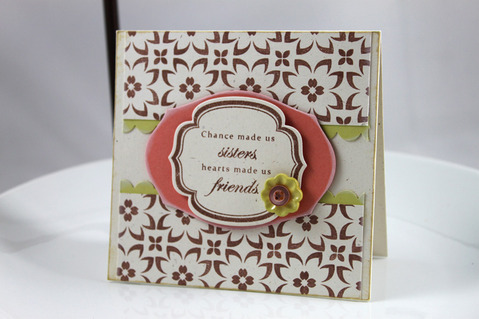 Playing along with The Paper Variety this week, I used their tic-tac-toe of Make a Card, Use Pink, and Add Stitching. 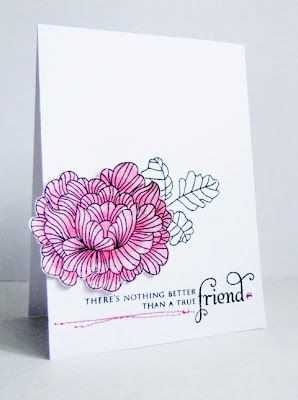 After coloring the bloom and fussy cutting it out, I adhered it to the card base in just the center. 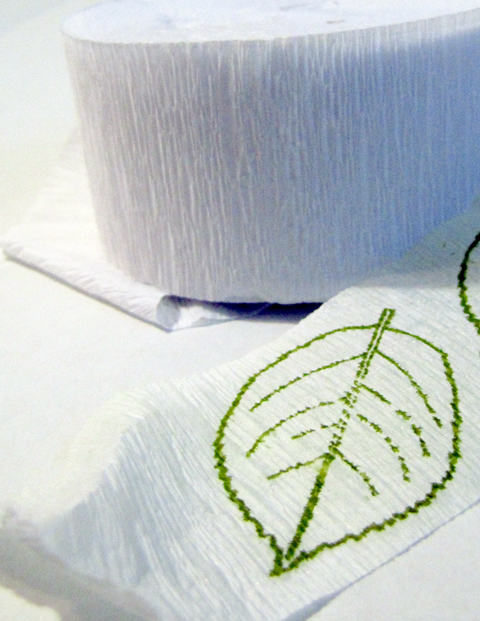 The card base was stamped with the leaves and sentiment, and stitched. 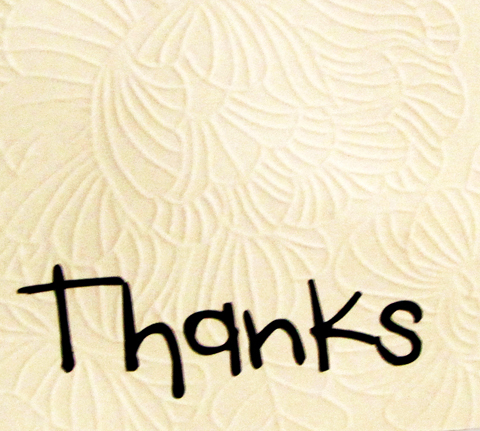 A clear rhinestone was colored with the marker to bring the color to the opposite side of the card. Okay, I'll be the first to admit that the "bosses" through a big project our way for this week's CAS-ual Fridays Challenge and I was skeered! Create a 4x9 card and embrace the white space! 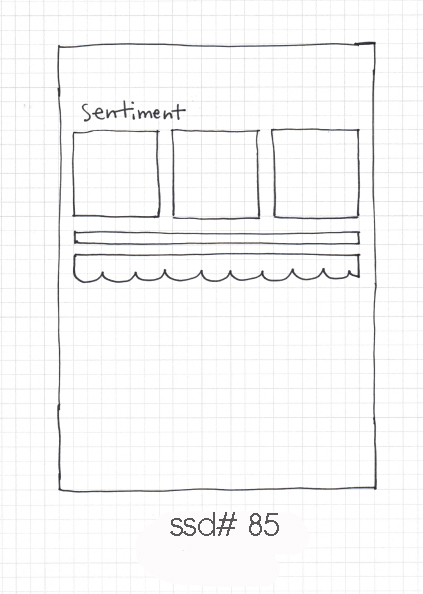 Woah Nellie, create a card that isn't standard? Woah, What? Not fill it up with stuff? But never being one to back down I stared down this challenge and came up with the following card. This size is the perfect size to take to the office and get the tons of swoopy girly signatures for a co-worker during her time of distress. 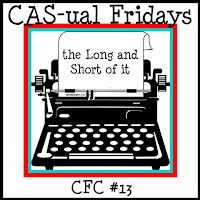 Find out more details about the challenge, read the challenge rules and find tons of Long and Short inspiration from the Girl Fridays at the CAS-ual Fridays Challenge Blog. Oh, and did I mention that this week's sponsor is Lawn Fawn? Um, yeah, you really need to make a long card now! My grandmother has a birthday coming up and she loves strawberries! What could be more sweet than strawberries full of treats? Please head on over to the May Arts Blog when you have a free minute to check out my version of some paper strawberries! I'd love to hear what you think of my tutorial, any suggestions for the future? Most every song from Sting tugs at my heartstrings someway or the other and beleive me, Fields of Gold was stuck in my head for forever after making this card! How about we take a walk in a field of dandelion dreams today? 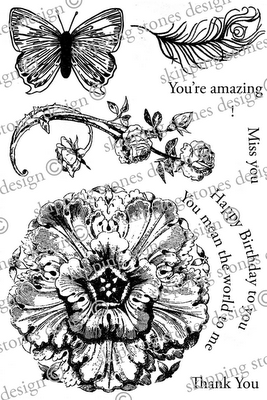 Another fabulous sketch from Skipping Stones Design, designed by Kim Kesti. 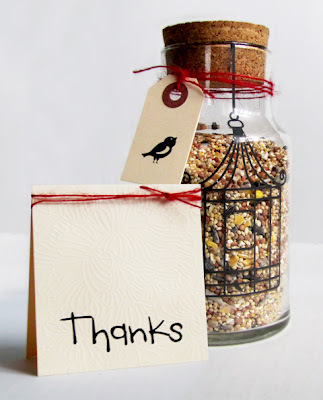 (Check out her blog today, I hear she has a giveaway!) 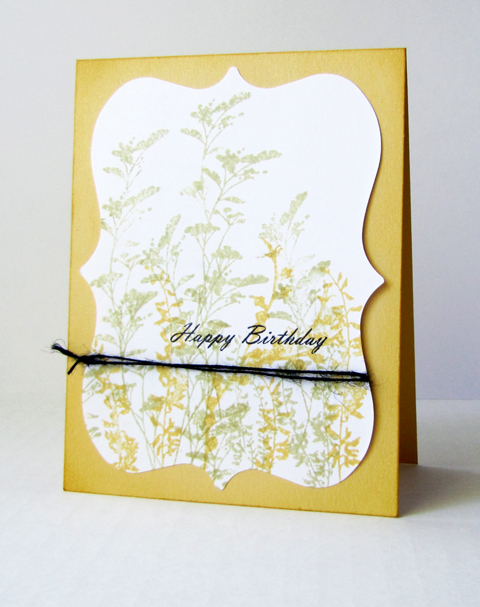 I used a die cut shape gifted to me by a bloggy pal to create a background for a stamped field using Dandelion Dreams from Skipping Stones Design and two colors of pigment ink. I needed the sentiment to stand out so after stamping it in black I added some Black Burlap String to tie the piece together. Only two ends of the die-cut are glued down, the image bows slightly in the midddle-an effect that I rather think I like. Firstborn: Mama, I got a good joke. Firstborn: Mama, what's black and white and red all over? Me: (Grinning, because I already know the answer...)That's not a joke, that's a riddle. Firstborn: Ok. Mama, I got a good riddle. Firstborn: What's black and white and red all over? Firstborn, in a fit of giggles: A newspaper, silly. Get it? Not the color red but read like you are reading. Me: Hah, that's a good one. 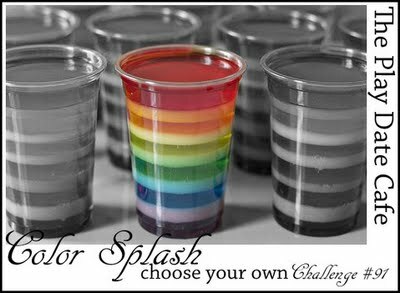 The Play Date Cafe is having one of their famous Color Splash Challenges, to create a black and white card with a splash of red. I was also inspired by the current card over at CASE Study Challenge, created by the fabulous Dawn of Wplus9 herself. 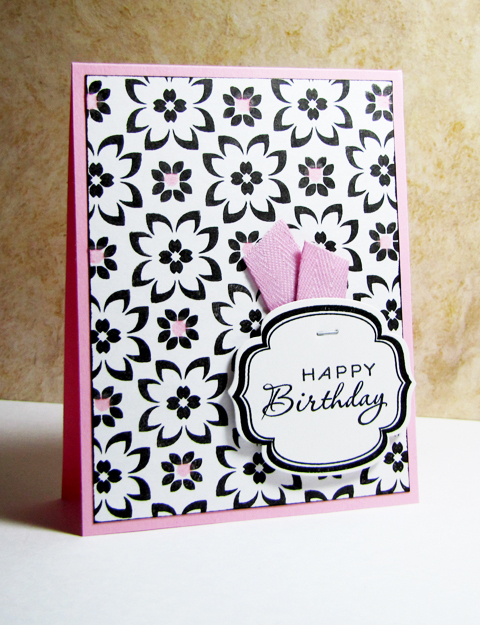 The background panel was stamped with two images from Poinsettia Patterns in black and then with a dot from another set I added some pink with glimmer mist for a cohesive look. I'm not sure what the deal is with blogger, but you can see these details better if you click on the image and it becomes life size. Hope everyone is having a great weekend! 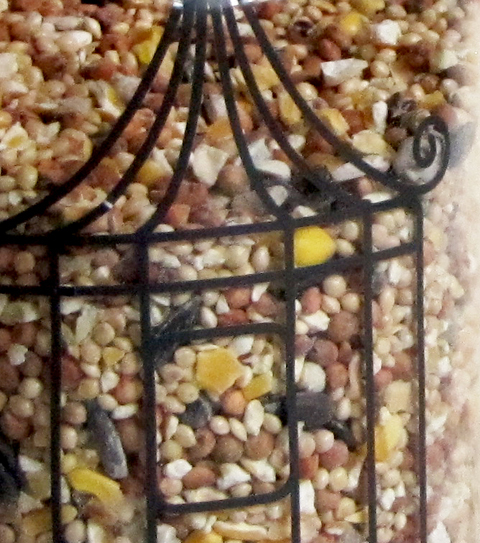 Strolling down the aisle at the local farm and fleet store, my attention was suddenly diverted to the ala carte bird seed station about ten yards away. There it was...glorious, monochromatic, neutral hues all lined up in see through bins with fine amounts of divine textures. Having no clue as to what the outdoor flighty creatures really craved, my take-home bag was a concoction of this and that. 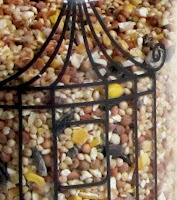 This gift, literally, is for the birds! CAS-ual Fridays has a new challenge up-Here's the Rub: create a clean and simple project using rub-ons or stickers! The blog has all the details about the challenge, challenge rules, information on our fabulous sponsor, E.A.D. Designs, and fun inspiration from the Girl Fridays! I applied the large sentiment onto cardstock with ease-and then...I ran it all through the embossing machine and there are no cracks or catches! I once read of a story about a boy who helped a butterfly out of its cocoon after seeing it struggle. Waiting patiently, the boy watched for it fly away but sadly, the butterfly never left the ground. What the boy didn't know was that in his kindness to help remove the struggles, he did not let nature take its course the necessary means for the wings to fully form in the butterfly. Without struggles in our own lives, we will never conquer the obstacles barricading our freedom to fly, to become strong and beautifully individualistic. 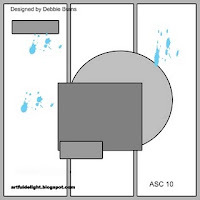 Time for another wonderful sketch challenge at Skipping Stones Design! 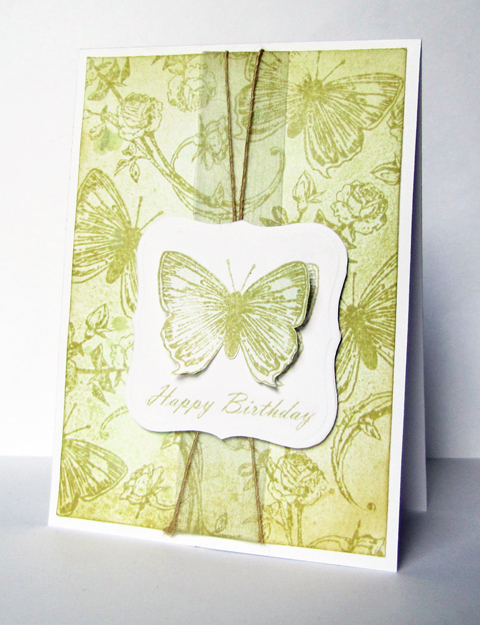 Using the butterfly from Victorian Summer I stamped it three times without re-inking between each impression. The background was created with the same ink and a lot of water. The card is finished with some lovely scroll work from Timeless Textures and a sentiment from Dandelion Wishes. I absolutely love that the majority of Skipping Stones Design stamps can be interchanged without much thought to complete a cohesive design. I'd love to see what you come up with for this sketch! 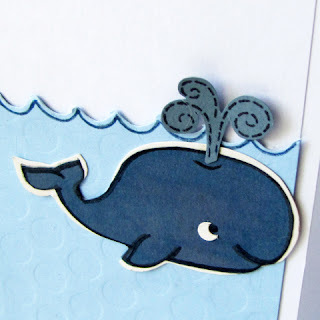 All the details are on the Skipping Stones Design blog, can't wait to see your creation! 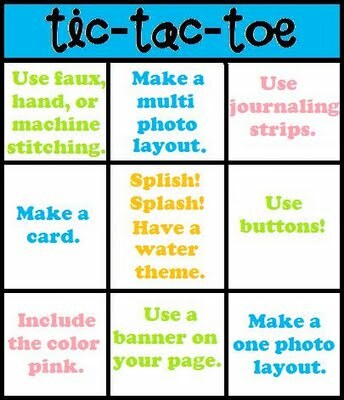 Did I mention that the winner receives a FREE stamp set? Yes, I'm serious! It was the first time since the last wedding that all of us were together and had time to do a photo shoot. After donning black, white or gray with blue jeans we stalked the city and found the perfect place-an alley way with an exposed brick wall building. Overall the photos turned out great, but the experience of being together again was even better. 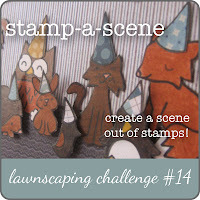 I'm excited to be guest designing for The Lawnscaping Challenge once again! 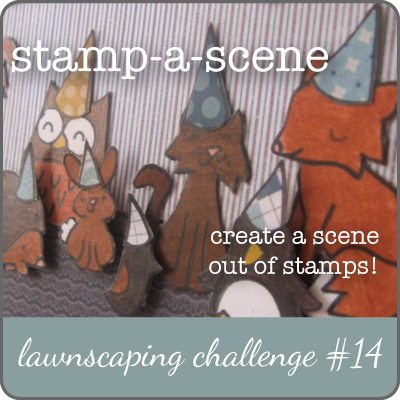 The crew has challenged us to create a scene with stamps! 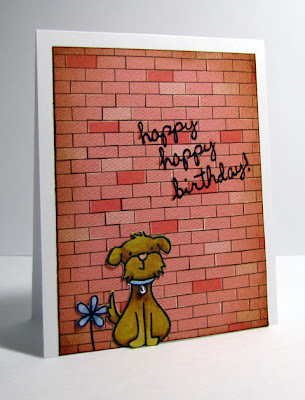 I pulled out some brick patterned paper and then added a fussy cut and colored puppy and flower from Critters in the Burbs. To complete the look and add a sentiment, I used Sophie's Sentiments to make some graffiti on the wall. There is a fabulous prize up for grabs, stop by The Lawnscaping Challenge to check out the details and see more fun scenes. I'm a maple tree. This site gives insight on your birthday tree. What tree are you? 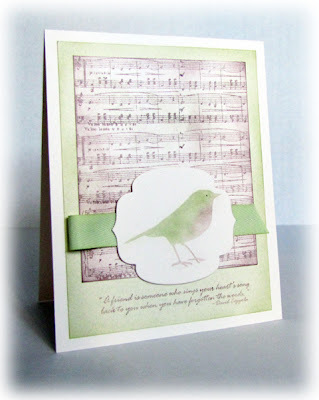 Today I'm hopping along with other Waltzingmouse Stamp fans, with this month's theme being a Birthday Party! I pulled out some birthday party supplies in the form of a crepe paper roll and fiddled until I came up with something I liked. Leaves, lots of misted, crinkled and pretty rose leaves from Roses in Bloom. 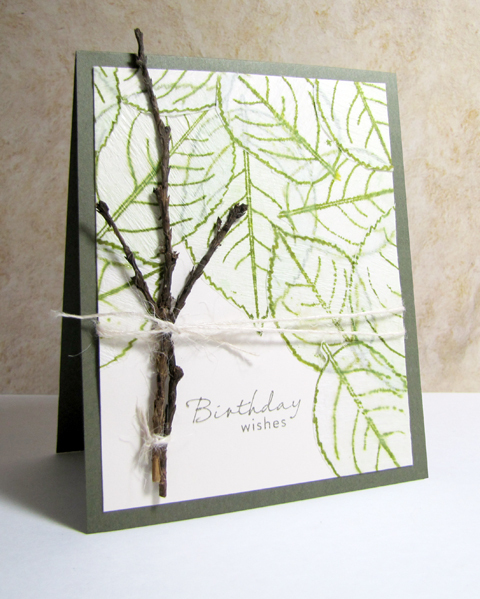 I layered them to my card base in a random fashion with some gesso and then after the panel dried, I finished the card with a birthday sentiment, some real twine wrapped twigs and then adhered it to a dark green base. 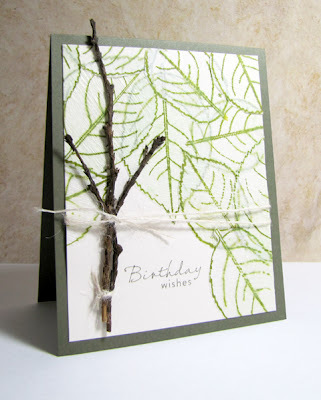 Even though the leaves are technically from a flower stamp set, I appreciate the fact that they didn't discriminate on my card and became tree leaves, and trees to me are a good representation of age. The little quiz mentioned at the beginning of my post is quite fun, and true for me-the good and the bad! Is your Birthday Tree a good representation of you? What would your one sweet wish be? If you are little boy would be a roly poly puppy that follows you anywhere and everywhere? If you were a sassy teenager would it be a permanently padlocked room from the inside? Would a brand new shiny car parked in your newly built house be a sweet wish as an adult? Or if you were an elder person would your sweet wish be to hold a brand new baby in your arms and coo at him until your heart's content? The newest CAS-ual Fridays Challenge is up and it is a sweet one! 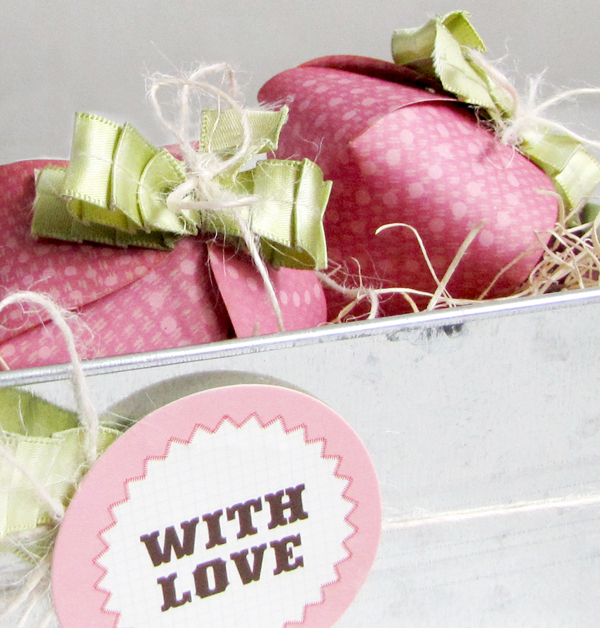 Create a clean and simple project featuring sweets or treats! Please be sure to head over to the CAS-ual Fridays Blog for more details, the rules of the challenge and to learn about the sweet prize package offered by PSA Essentials as well as treating yourself to some fabulous eye-candy from the Girl Fridays! Underneath the big, big tree many many years ago, you'd find three or four girls, on hands and knees, glasses two inches from the ground...searching, searching for something in twenty allotted minutes during recess. The perfect acorn of course! For their acorn stew, their acorn family, their acorn decorations-whatever really struck their fancy that day...it just needed to be perfect! Love this big acorn. It is thee perfect acorn from many many years ago. 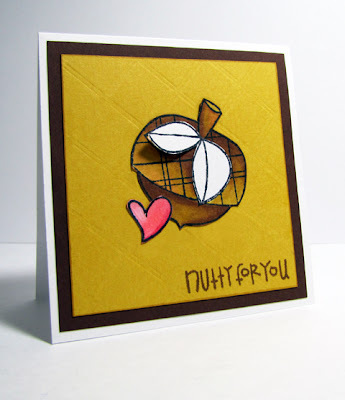 I used the top right color corner of (white, pink, sunshine and chocolate) for the Paper Smooches Sparks Challenge as my guide for coloring thee perfect acorn. Be easy on me, this is my first attempt at coloring with Copics! (Thanks Elizabeth!) 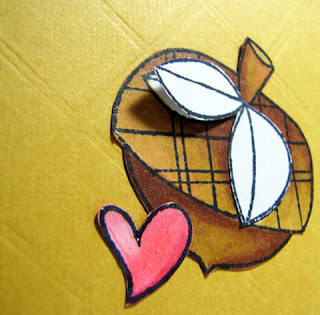 I kept the entire card pretty clean and simple so I could let thee perfect acorn shine in all its glory. But... I did add just a few surprises, like a shiny enameled heart and embossed picnic background. 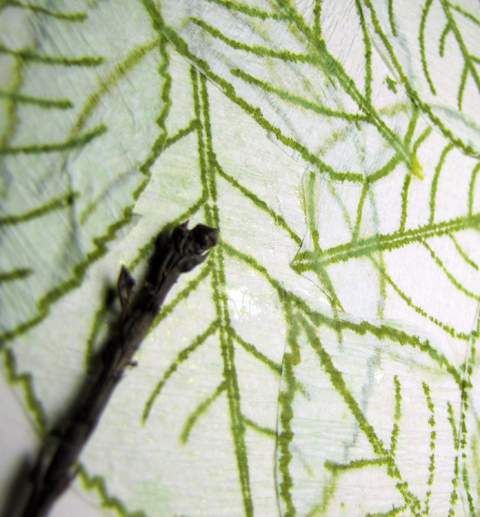 Also, one of the leaves are pieced and popped for dimension. I wanted to add the sentiment: "so thrilled you picked me" because it reminded me of the days way back when, but, my husband gave me the funniest look and said this one would be better. Ok, I guess that means I just have to make another version when he's out! I don't know if I like this card more because of the big bold colors, the fact that I colored or because it made me think of how goofy I looked in my first set of glasses! Welcome to the Skipping Stones Design Sketch Challenge 84 and the release of Victorian Summer Blog Hop! You should have arrived from Barb's blog. If you just happened along my blog today, you can start at the beginning of the hop at Skipping Stones Design there you can find out all the details as well! 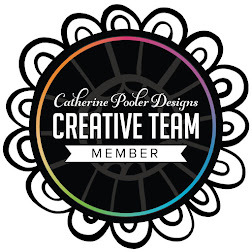 Be sure to hop along and leave comments on all the fabulous designers blogs . 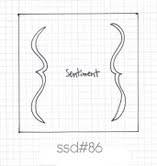 The sketch for this week was once again designed by Kim Kesti. 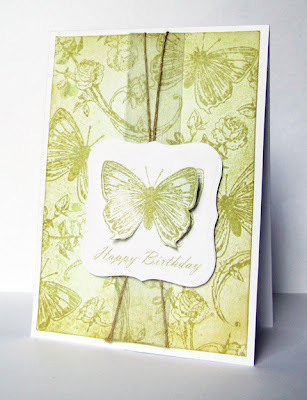 My card was inspired by the gorgeous Victorian wallpaper: I stamped in a yellow/green ink in a random fashion the rose vine and butterfly images onto white cardstock. I then misted the panel with a light green mist. The butterfly was fussy cut from white cardstock and then mounted to the main image panel that had also been stamped with the butterfly. 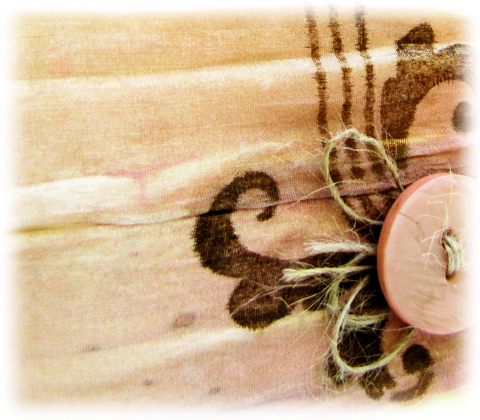 I added some May Arts Sheer Ribbon and Natural Burlap String to complete the design. Isn't this set swoon worthy? Head over to Brenda's blog for some more Skipping Stones Design inspiration! 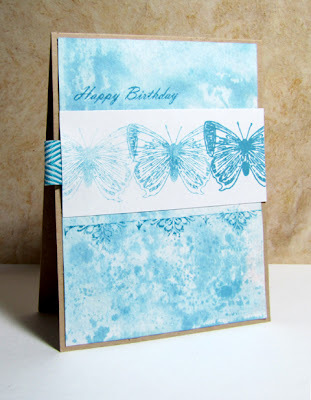 Ink: (River Rock Pigment) Stampin' Up! 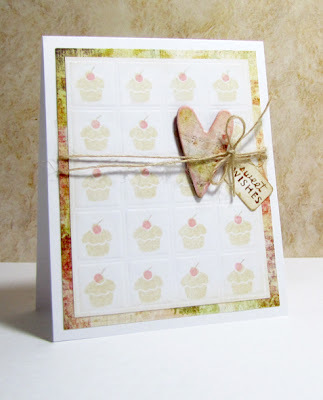 My first May Arts post is up and I'd love for you to stop by and check out my projects featuring May Arts Ribbon and Stampendous Stamps! 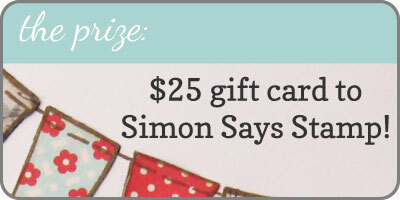 you might be a winner of some fabulous ribbon and stamps! "A friend is someone who sings your heart's song back to when you have forgotten the words." Sometimes an image just calls to me from its packaging and begs to be used. I think the bird for today's card did just that. 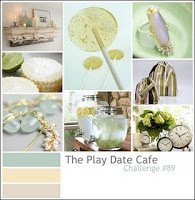 Along with soft set of colors offered up by The Play Date Cafe Challenge I was smooth sailing into relaxation mode. Aah, love when that happens. 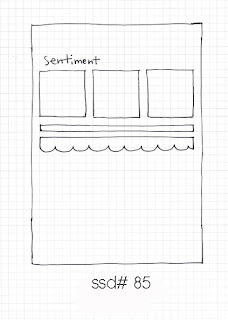 I also used an old sketch from Skipping Stones Design to help aid my creation. The bird was stamped with watermark ink onto a die cut panel and then colored with chalks. Hooray, today is the Lovely Layers Denami Blog Hop! If you've arrived from the awesomely talented Britta's Blog, then you are on the right track. Isn't her bright card superb? The Denami Design Blog has all the details and complete list, if you want to start from the beginning or should get lost. 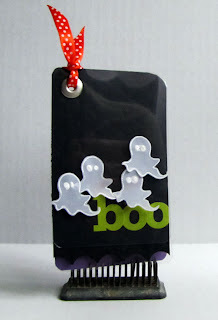 Even though we are smack dab in the middle of summer, I wanted to play with the new release and feature a layered tag. The little friendly ghost makes me smile so! Layer 1: Ghots: After heat embossing and fussy cutting a few ghosts from vellum paper, I adhered them to a sheet of transparency with some enamel accents behind their eyes only. Layer 2: Black Boo: A piece of black cardstock was run through my cuttlebug using an impression plate, then I added some letter stickers. 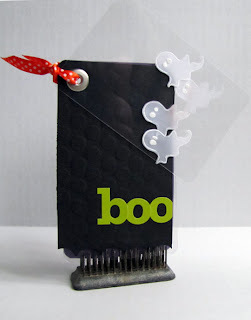 Layer 3: Dotted Transparency: A plain piece of transparency was run through the embossing machine using the same impression plate as the Boo layer. 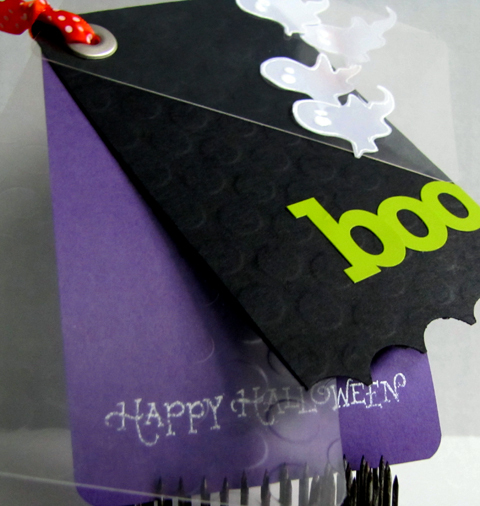 Layer 4: Purple Halloweeen: I heat embossed Happy Halloween greeting on purple cardstock. The whole tag is set with a large eyelet and tied with some fun polka dotted orange ribbon. 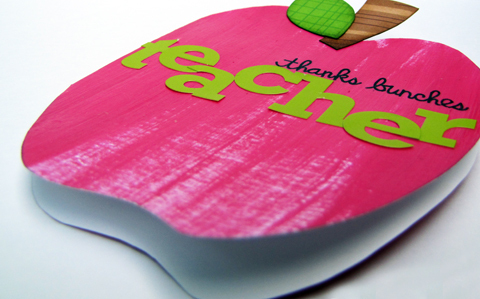 Here's a view of the tag before turning the layers to reveal the hidden greeting. 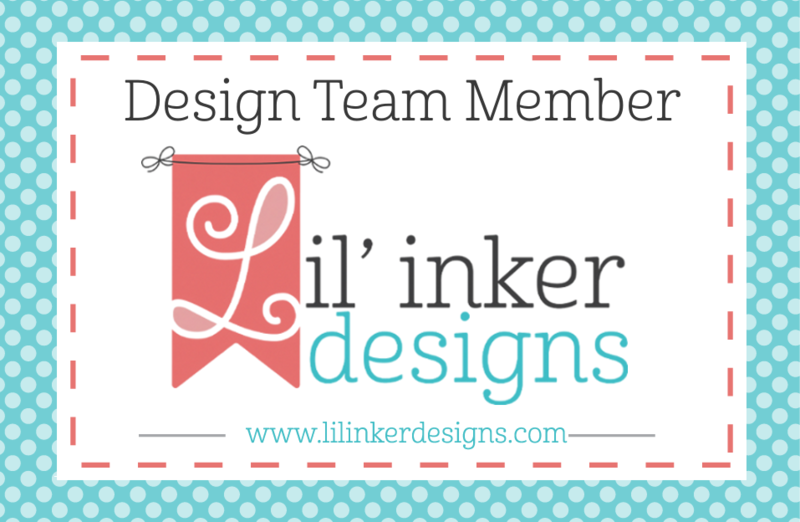 Your next stop is one of my first ever blogging pals, the ultra talented and ultra sweet Lisa! Denami Design is giving away two $20 gift certificates to their store to random comments along the hop. 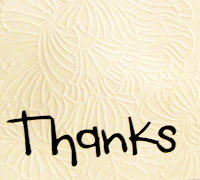 You have until July 11, 2011, 11:59 pm PST, to leave comments on all the blogs (to be eligible for a prize). Baby photograph by Coby Photography. I've been staring at this photo for months now, as it is taped close to the computer screen and decided that it deserved to be scrapbooked. With a little help from the sketch at Artful Delight, it now has a proper home. I pulled out the Freshprint Clothesline line from Little Yellow Bicycle too, it has set a whole year unused since I had won it last year in Gallery Idol. 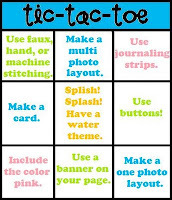 Moxie Fab World has a Beautiful Borders Challenge going on, and although there certainly isn't anything crazingly innovative, it helped me pull out some items from the collection and actually use them in a different way. I guess I've realized things shouldn't sit around anymore, especially my pictures. Speaking of Gallery Idol, congratulations to the top 20 in 2011! It is so great to see so many talented people being recognized. I wish you ladies the best of luck in the weeks to come! Candied apples. Candied yams. Candied bacon! Moral of the story? Everything tastes extra yummy when it's candied! Super excited (perhaps it is the sugar rush?-hah!) for this week's CAS-ual Fridays Challenge to create a shaped card! There is one fabulous prize up for grabs from Paper Smooches! 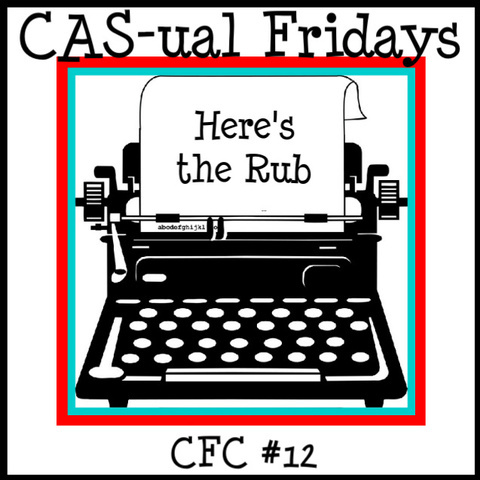 For additional challenge details, rules and fabulous eye candy from the Girl Fridays, please visit the CAS-ual Fridays Blog! 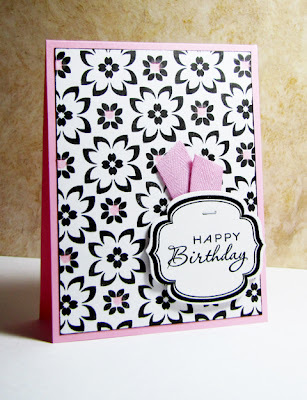 Kim from Paper Smooches makes creating shaped cards extra easy when using one of her many fabulous templates! I used the Apple/Pumpkin template. I first printed the template out onto white cardstock, coated it with hot pink acrylic paint (after seeing this inspiration piece here, there was no other color option!) and cut it out. I stamped the sentiment from Paper Smooches Vegtastic and then coated the piece with gesso, for a purely candied finish. 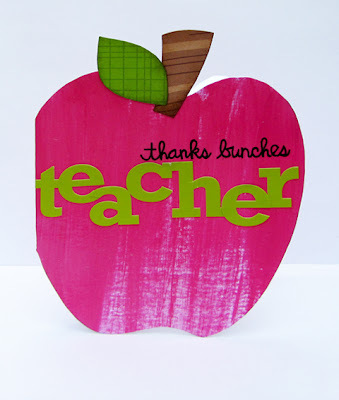 The card was finished by paper piecing the stem and leaf and adding some bold stickers. Looking forward to seeing your shaped creations in the CAS-ual Fridays Gallery!